Home » Blogs » jamess's blog » Edwards Evening News RoundUp: Some Things are STILL Worth Fighting for! Edwards Evening News RoundUp: Some Things are STILL Worth Fighting for! Well that was quite the statement in Iowa! Thanks to record turn out to the Iowa, the "Candidates of Change" got over two-thirds of the Votes! If this is any indication of how ALL of America feels, maybe a Progressive Candidate, DOES have a Chance to Win the White House, maybe even with a Progressive Agenda? "Earlier tonight, I called Senator Obama to congratulate him on his victory in the Iowa caucuses. Tonight's results shows how clearly the American people are sick of the status quo and ready for a president who will fight for the bold change America needs. "I would also like to extend my best wishes to Senators Biden and Dodd and thank them for their service to our country. They ran impressive campaigns focused on the real issues that matter most to hard-working families, and I have faith that they will continue to work to build the better America we all believe in." That's a Class Act with a personal touch too! There was "no need to Concede" -- as some have alleged since the Fight is NOT over! This is only Round One of a 50 Round Match! No One is throwing in the towel, in the Edwards camp, nor among his real Supporters either! Some people seem to confuse Passion with Anger. John Edwards is passionate about Progressive causes. He is Fighting to give the Middle Class a Voice again, as have many Real Progressives before him, Teddy Kennedy, RFK, FDR, and Teddy Roosevelt. For most of the year, Edwards has faced a Media that has "been less than accommodating" to him. Is it any wonder, that when he finally had an opportunity to address the Nation unfiltered, that Edwards made the most of it? That's what Fighters do! Very Smart use of the Media! with the "bully pulpit" at his disposal? 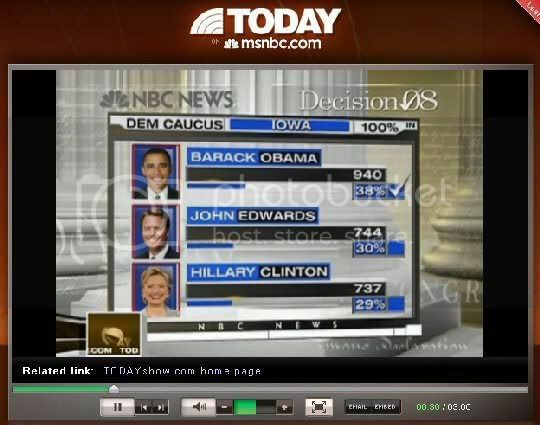 All right, I know Edwards did not Win Iowa, but he had a very strong showing, given the intense competition he faced. Edwards was out spent, by about 5 to 1, and left out of most Media Election Coverage for most of the year -- and YET he's still there right in the thick of things! 2nd Place IS Significant despite how the Media chooses to spin it! ... What I'm going to do is make sure I focus on what people care about -- fighting for the Middle Class, fighting for Jobs -- Making sure that we do something about the Corporate Power and the Corporate Greed, that is having such an impact on Middle Class families in this Country. ... No body on their side [GOP] raised the kind of money Senator Clinton and Senator Obama did -- I mean they were in the stratosphere. And they've got huge Media coverage for the entire Campaign. I mean, I basically beat the Clinton Machine, where I was grossly out spent by them, and I was competitive with Senator Obama. And now what we know is: we're going to have a 'Change Candidate' for the next Democratic Nominee for President. And the Choice is going to be between me and Senator Obama. And Voters here in New Hampshire are NOT going to be told what to do. We're NOT going to have an Auction here, we're going to have an Election! I can tell you, I'm in great spirits! -- even on an hour's sleep last night. I'm here in New Hampshire and I'm going to fight with everything I've got and I'm Optimist! So you see the Progressive Fight goes on ... and John is leading that charge. And what do impartial, objective Journalists think about the Iowa Results? What do the Iowa results mean? This was also another important factor. The Republican turnout was about 115,000, up on the 2000 figure of 87,666. For the Democrats it was even higher, with some 239,000 turning out to register their choice, up from 124,000 four years ago. This seems to reflect Mr Obama's success in reaching out to first-time caucus-goers and independents. Many voters under 25 turned to him and he also outpolled his main rival Hillary Clinton among women. Who were the biggest losers? Without doubt the most glaring loss was for Senator Clinton, long considered the Democratic frontrunner and who once enjoyed a significant lead in the Iowa polls. John Edwards, who also campaigned on a theme of a break with the status quo, will be hoping his strong finish to secure second place in Iowa, ahead of Mrs Clinton, will boost his campaign. Are there any lessons from history? Very often it is not so much about winning in Iowa but doing better or at least as well as expected. So even the BBC gives John a Fighting Chance! Of course our own Media seems slow to do the same. 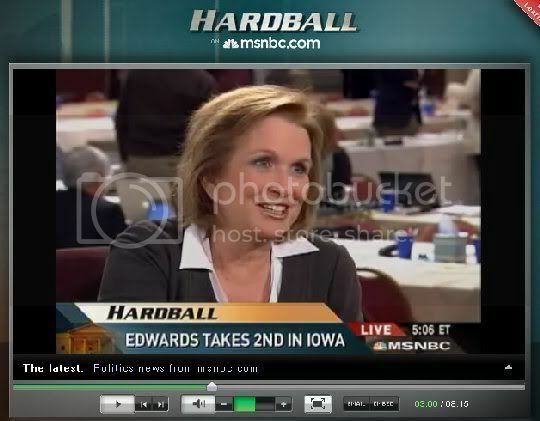 Elizabeth managed to disarm Chris Matthews, in a way that I've rarely seen happen. She kept challenging the lack of the Media Coverage for John, and challenged shows like Hardball to do better! Chris Matthews: Last time around John Kerry won in Iowa and then he won in NH. There seems to be a pretty strong "sling shot" effect -- Like how do you beat it? Elizabeth Edwards: ... that happened to us too in terms of John Kerry getting a lot of press. The other thing of course, is that we had the "Dean Scream" in 04 -- which sort of made the 2nd place John had, not mean as much -- cuz you all covered that, as opposed to the 2nd place finish. Now of course your covering "Hillary's 3rd place finish", instead of John's 2nd place finish, So we're still fighting against you guys! At the close, Chris even admitted: "Well he gave a good speech last night. And I think he is a Great Candidate." Elizabeth, somewhat stunned, asked him, "Could you repeat that?" Matthews: "I think he is a Great Candidate." Elizabeth needs to go on more Talk shows, like this, if you ask me -- she's very good at it! Chapel Hill, North Carolina – Following a strong second-place finish in the Iowa Caucuses last night, the John Edwards for President campaign announced record-breaking online fundraising totals, putting the campaign on track for its best online fundraising day to date. "We have been absolutely overwhelmed by the response to Sen. Edwards' strong finish in Iowa," said Edwards' senior strategist Joe Trippi. "We're on track for our best online fundraising day ever, since www.JohnEdwards.com went up a year ago – and half of the contributions we're seeing are from new donors to the campaign. That speaks volumes to the strength of John Edwards' message of standing up and fighting for the middle class." Between the hours of 10:00am and 11:00am ET today, the campaign experienced its best online fundraising hour ever. John Edwards is the only Democratic candidate in the race who has never accepted a dime from PACs or Washington lobbyists. The campaign also noted that the impact of many of today's online contributions will be doubled by federal matching funds. Well fellow Edwards supporters, this Fight is a long ways from over, despite how often the Media may keep trying to write John Edwards "out of the Picture". Edwards is continuing to Fight, and we should too. Since the Media, seems to measure the worth of a Candidate by their Donation Totals -- Let's really give them something to Talk about! If you want to change the world for the better, sometimes you just have to Step up! Somethings are indeed worth fighting for -- like a truly Progressive, Democratic Agenda, that doesn't concede anything, without putting up one hell of a Fight! Wow! It's time. Be John Edwards' Second Wind. Idaho Hearts John Edwards: Kossacks Can Help Show that Support. 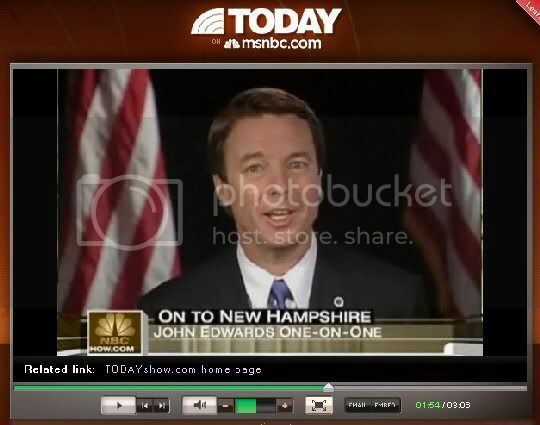 It seems like those Internets are STILL buzzing with support for John Edwards! Update: I see John Edwards is on K.O. tonite too, nice! Just the fact that he came in second was great! Edwards edged out the Hillary machine that's been developing this campaign for nearly a decade!